GUIDE PRICE 625,000 - 650,000. Freeman Forman are delighted to present this charming period three bedroom semi detached family home. 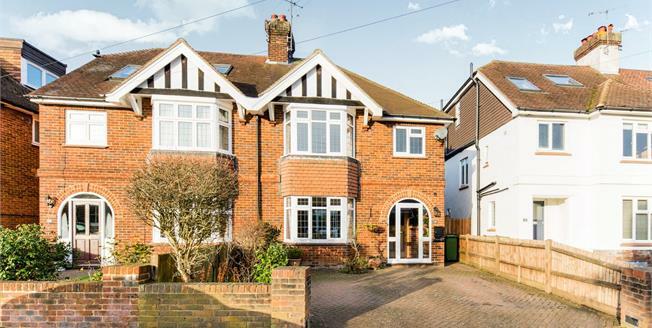 The property has been significantly updated by the current owners over recent years, and is located in an enviable position close to the Town Centre, Mainline Railway Station, and numerous reputable Schools. The property benefits from a large attic space which many of the neighbours have converted into fourth and fifth bedrooms. The immaculate accommodation includes a front porch, entrance hall, sitting room with wood burner and bay window, dining room, large conservatory with under floor heating and a recently refitted kitchen with under floor heating. Stairs lead from the entrance hall to the spacious first floor landing with access to the large attic space. There are three bedrooms located on the first floor, a recently refitted bathroom suite with under floor heating, and a separate WC. The accommodation benefits from a recently installed gas central heating system, new roof (approx two years ago) and double glazing throughout. Outside the property enjoys a smart block paved driveway with dropped curb allowing off road parking for two vehicles. There is gated side access to the rear garden which is laid mainly to lawn with the ability to create a useful outside office/studio similar to the adjoining neighbour. An internal viewing of this family home comes highly recommended.